Ed Tyler has written an interesting response to the previous posts in this series (I, II) on his bioregioning site. He makes a number of interesting points that are worth reflecting on, but here I’ll limit myself to his reference to the Watsonian Vice County map. 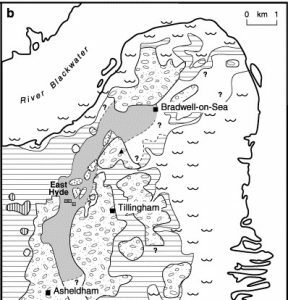 I first came across the Watsonian Vice County map in the course of researching the “pre-history” of bioregional thought in the Atlantic Archipelago and it seemed a worthwhile line to pursue. In his 1852 book Cybele Britannica. Hewett Cottrell Watson divided most of the archipelago islands into 112 distinct areas in the service of accurately recording plant distribution (the remaining were similarly divided in 1901, when Robert Lloyd Praeger introduced a similar system for Ireland and its off-shore islands with 40 vice-counties [‘Irish Topographical Botany: Supplement 1901 – 1905’, Proceedings of the Royal Irish Academy]). This vision of mapping these islands and their constituent parts in the service of biological considerations seems on first look to be clearly bioregional. On a second look, it’s more complicated however. The vice-county maps are a naturalist’s device for dividing the landscape born of phytogeography (Watson was an amateur botanist), but it being devised before the development of the ecosystem concept it’s more a tool for field biology than an output of field ecology. The equality of size thus afforded more accurate comparison work about the distribution of life-forms across the landscape – but necessarily meant that the divisions were ecologically arbitrary – as it is in the grid system implemented in the 20th century. The boundary lines of the vice-county divisions consist of a mixture of natural and man-made features: so rivers, coasts, and watersheds for sure, but also high roads and canals – and, of course, a legacy dependence on the pre-existing county lines. In East Anglia – a completely artificial line divides both Norfolk and Suffolk its location determined as x degrees latitude East of Greenwich. Ed notes, fortuitously, that ‘Watson’s map (topographically the whole of the long, thin peninsula facing N-S) answers perfectly to my home region’ which he illustrates with a map of VC101 Kintyre. This vice-county is predominantly defined biogeographically by the coastlines of the peninsula and the Isle of Gigha – with only its northern boundary defined by an artificial feature – the Crinan Canal (opened in 1801), which arguably is located at the site of a natural break in the landscape. Ed makes a convincing case that this boundary separating the peninsula from ‘the rest of “Main” Argyll’ might be more meaningful than the current use of ‘Kintyre’ to refer solely to the land mass to the south of the West Loch and also that there is clear value in the determination of his bioregion equating ‘to a wildlife-recording area, big enough to include whole ecosystems such as blanket bogs and celtic rainforest’. When I turn back to a Dengie perspective I run into trouble with a Watsonian approach. The division of ‘South Essex’ (VC18) from ‘North Essex’ (VC19) uses the coastline of the Blackwater Estuary and the rivers Blackwater and Chelmer, but then continues largely westward following the line of roads in urban Chelmsford before following the course of the A414 to North Weald then south-west along the course of the B181 through Epping to Jack’s Hill before taking the route of the A121 to Waltham Abbey and the traditional county border of the River Lea (Watson could describe this line simply as ‘the high road from Waltham and Epping to Chelmsford, and thence… the Blackwater River’). After the rivers this is clearly an arbitrary line, I’m sure the high road followed some line of ease in the landscape but I’m not convinced it’s a meaningful landscape feature and Watson never intended these boundaries to be considered so. The divisions of the counties were made simply on ‘a dividing line which is not in doubt’ ‘readily distinguishable on maps, and most of them… obvious in the field’ (J.F Dandy, Watsonian Vice-counties of Great Britain (1969)). Rather than aids to the generation of new maps based on some biological imperatives, they are artifacts of existing maps making claims on the land itself. So I return to the Dengie peninsula, we have no clear tracing of a boundary between the tidal reaches of Blackwater/Chelmer and Crouch – no Crinan Canal to form a separating ribbon of water, nevertheless a straight line drawn between the two would hardly be worse than the Waltham to Chelmsford high road. Some greater artistry might find a more satisfying route climbing up from the tidal reach of the Chelmer at Beeleigh to the summit at Danbury then on down to the Crouch’s tidal limit at Battlesbridge. In some cases, as with Ed’s Kintyre, the Watsonian divisions may happily accord with divisions established otherwise. In relation to the last bullet above, and thinking back to the last post, it’s interesting to note that the Danish equivalent of the Watsonian system is based on the herreder, administrative areas equivalent to the English ‘hundreds’ comprising several parishes( J. E. Lousley, ‘Maps showing Plant Distribution in Britain and European Countries’, in J. E. Lousley (ed. ), The Study of the Distribution of British Plants; Being the Report of the Conference held in 1950 By The Botanical Society of the British Isles).